SLAVYANSK, Ukraine -- At first glance, the carefully worded, soot-stained document adorned with an official stamp looks like a weathered decree from World War II. 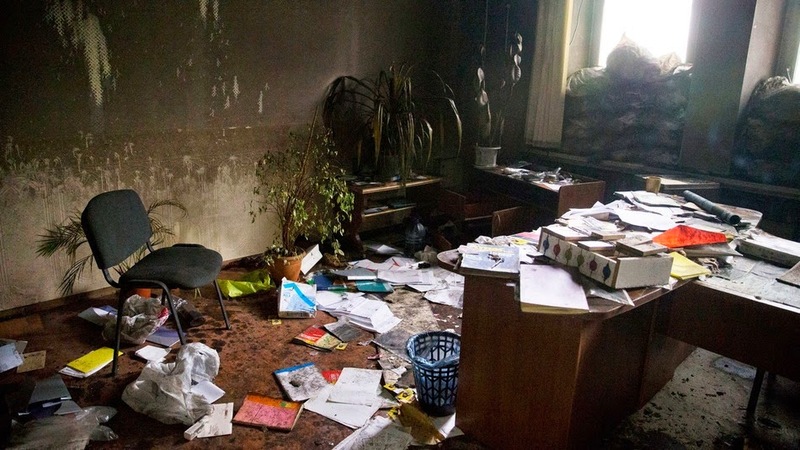 The abandoned office of Igor Strelkov, commander of the Donetsk People's Republic. The execution orders were found in this building. But dust it off and take a closer look and it becomes clear that it’s an execution order. It was signed off by the enigmatic commander-in-chief Igor Strelkov on June 17 and delivered by a military tribunal of the self-styled rebel government of the Donetsk People’s Republic (DNR), the breakaway territory that voted to secede from Ukraine in a sham referendum in May. The document was recovered by Mashable on July 7, two days after thousands of separatist militiamen fled Slavyansk following weeks of shelling by Ukrainian government forces and consolidated their forces in the regional center of Donetsk. It was found along with another order to execute two members of the rebel militia – Dmitry Georgyovich “Bolgar” Slavov and Nikolai Alexandrovich “Luka” Lukyanov – convicted by the military tribunal for kidnapping a local man, looting his home and jailing him in the basement of the SBU without permission from Strelkov. A rebel fighter who asked that he remain anonymous because he was not allowed to speak to journalists confirmed their execution, saying that he had been stationed in Slavyansk at the time. Local media first reported news of the men’s deaths last month, but had not confirmed their execution. Strelkov acted as chairman of their tribunal, according to documents. He signed the order “Strelkov,” but also printed the name “Girkin Igor Vsevolodovich” beneath. In a third case, another militiaman – Alexander Valeryevich Pyrozhenko – narrowly escaped a firing squad when he was acquitted of treason following an incident in which he shined a flashlight at night during a firefight with Ukrainian government forces, a move his comrades deemed to be “treason” for giving away their position. Slavyansk, typically a peaceful resort city of some 120,000 residents, was the epicenter of Ukraine’s battle with separatists and a notoriously dark place during the rebel occupation. After heavy shelling by both the Ukrainian and rebel forces over the course of the past two months, much of the city has been reduced to rubble. Its SBU building was a dungeon in which rebels held dozens of journalists, activists and locals in captivity, and in grotesque conditions. On Monday, rancid food sat on a makeshift table in the building’s musty basement. A bar of soap used for washing sat on a window sill nearby. Stuck to a wall was a plastic bottle used to gather drinking water from a leak in the ceiling. On the floor were three damp mattresses covered in stains. Dozens of flies buzzed around the room, which was illuminated only slightly from a small window adorned with bars. Vice News’ Simon Ostrovskiy was held in the basement for three days after being captured by rebels, as were other journalists. But there are few who spent as much time in the building’s dank cellar as Irma Krat, a Kiev-based Ukrainian journalists who was detained by the rebels in April for “spying” and only freed after they fled the city last Saturday. Mashable found her passport and press card amid the scorched remains on the building’s first floor. She has since escaped and is now safe in Kiev. Signed by Strelkov, a war re-enactment enthusiast with a pencil-mustache and Moscow residency also known as Igor Girkin, who Ukraine and the West believe to be an active officer of the Russian Main Intelligence Directorate, or GRU. The death sentence of Pichko is an example of the severity and anachronism in which the self-styled republic is governed as well as the darkness that enshrouded the resort city of Slavyansk during the three months of rebel occupation. Pichko, 31, was tried and convicted on June 17 for stealing two shirts and a pair of pants from his neighbors’ home on the outskirts of Slavyansk on June 14. After the family had fled the city, he hopped a gate and broke in through a window on the backside of the house. Another neighbor led Mashable through his backyard to examine the window. Seven witnesses, including Pichko’s best friends, testified in the case. The tribunal presiding over the matter included six men subordinate to Strelkov: chairman Viktor Yuriyevich, known as “Nose”; members Vyacheslav “Baloo” Anatolevich and Mikhail “Grey” Aleksandrovich; prosecutor Yuri Vladimirovich, also known as “Lawyer”; defense counsel Aleksandr “Bison” Viktorovich; and secretary Sergei “Tryphon” Ivanovich. Pichko, a convicted criminal released in March after serving more than four years in prison for armed robbery, was apprehended by militiamen out front of a neighbor’s home on June 15 and tossed in the SBU cellar, according to neighbors. They said four militiamen in fatigues – two with Kalashnikov rifles – seized Pichko around 4 p.m. that day. “They came and took him… and we saw nothing else,” one woman said. Maria Vasylovna Pichko, 61, Alexei’s mother, told Mashable on Thursday that she had not seen her son since he was taken nearly a month ago. She said her husband, Boris Fyodorovich Pichko had gone to the SBU building to inquire about Alexei “three days after” he was taken. By that time, however, according to the document, he had already been sentenced to death. Maria Vasylovna was not aware of the death sentence or his apparent execution until speaking with Mashable on Thursday. Upon hearing the news, she broke down in tears in front of her home. “For two shirts… they shot him?” she said as she fought by tears. According to a neighbor who asked that her name not be used in this story, Alexei Pichko’s friend told her that his body “had been dumped on the front lines” of the fighting after he was executed. Mashable could not verify his story. Rounding out the document, Strelkov writes that the sentence has been carried out. “I warn all fighters and commanders of the DNR militia, and also residents of Slavyansk and the Slavyansk area, that any grievous crime committed in the zone of military activity will continue to be punished ruthlessly and decisively,” Strelkov says.